It was a bit foggy this morning after all of the rain and thunderstorms yesterday. 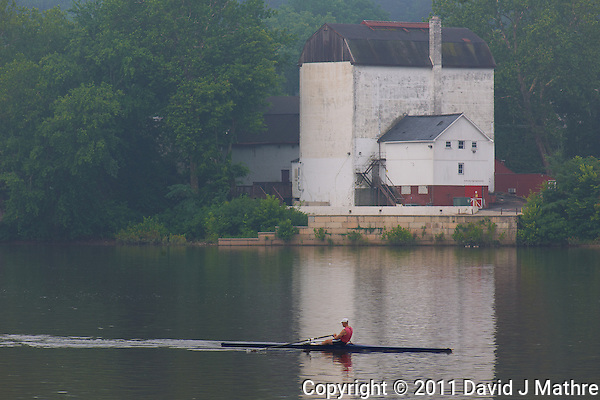 I saw this lone rower on the Delaware river out early between Lambertville, New Jersey and New Hope, Pennsylvania. Rower in the mist. Delaware River between Lambertville and New Hope. Image taken with a Nikon D3x and 105 mm f/2.8 VR macro lens + TC-E III 20 teleconverter (ISO 100, 210 mm, f/9, 1/125 sec). Raw image processed with Capture One Pro 6 and Photoshop CS5.